**SAVE BIG and purchase the books 26-28 in the Magic Tree House series at once! This BUNDLE is perfect for small groups, centers, homework, morning work, or part of your novel study! This packet is PRINT and GO ready! No time spent laminating, cutting, or setting up. Print and your kids are ready to use engaging ELA activities that follow K-2 ELA standards with the Magic Tree House series Books #26-28! To view each set on my store, look at the links below. @2016 All rights reserved by author. These materials are intended for personal use by a single classroom only. Copying for more than one teacher, classroom, department, school, or school system is prohibited. For use in multiple classrooms, please purchase additional licenses. This product may not be distributed or displayed digitally for public view. Failure to comply is a copyright infringement and a violation of the Digital Millennium Copyright Act (DMCA). Clipart and elements found in this PDF are copyrighted and cannot be extracted and used outside of this file without permission or license. See product file for clip art and font credits. 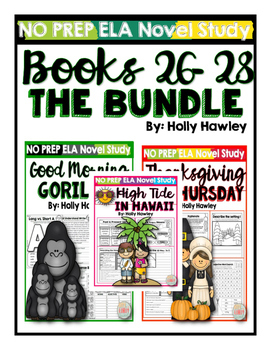 Magic Tree House Books 26-28 Bundle NO PREP (ELA) by Holly Hawley is licensed under a Creative Commons Attribution-NonCommercial-NoDerivatives 4.0 International License.